Much like Brien’s Windows-based editor for NBA Live 95, Tim’s editor for NBA Live 96 made it possible to edit the game’s executable file in a GUI environment. One of the big improvements in the new tool was the ability to load the roster data file as well as the executable, which meant that any in-game changes that you’d made to the roster were reflected in the editor’s interface. The newly added Create-a-Player mode also stored created player data in the roster.dat file, which meant that the editor was able to modify attributes that weren’t normally accessible in-game. 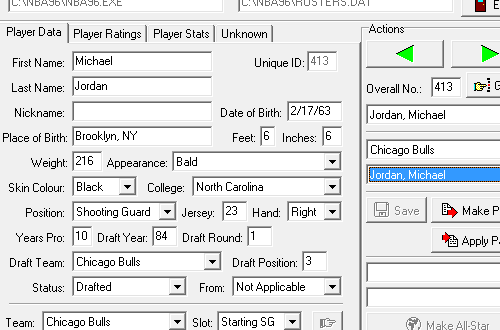 In other words, my created Michael Jordan could finally have a date of birth and Draft information! That wasn’t the only improvement. With the addition of a much more user-friendly interface that included drop-down menus in place of numerical values, it was a lot easier to edit original players, especially their appearances. Instead of having to add up numbers to set the appropriate face attribute, you could simply pick the one you wanted from the menu. The guys also discovered a method of renaming players that did not require the painstaking process of replacing text strings and assigning them to players individually. First names, surnames, and nicknames could be edited with ease, along with the place of birth. As a result, it was a lot tougher to mess up the files. There were a couple of other nifty features as well. By the final version, the editor included the ability to modify the schedule, even allowing users to change whether the night or day background was displayed in the pre-game menus. The schedule had to be edited day-by-day however, and there were no tracking or correction features, so you had to be careful. There were also tools to create and apply patch files, which allowed edits to the executable file to be distributed without uploading the .exe file itself. Players could also be easily added to the East and West All-Star teams with the click of a button, after choosing the desired roster slot on each squad. One drawback of the NBA Live 96 Editor was that the removal of the string editor meant that it wasn’t as easy to change some of the common text strings. 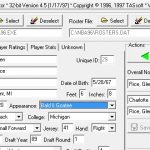 In the NBA Live 95 Editor, team names, the years that appeared as the previous season, and other text, could all be easily found and modified. 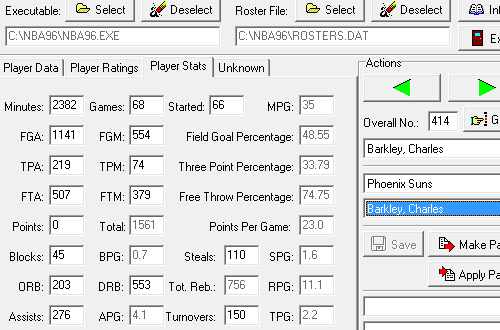 Although the NBA Live 96 Editor made it much easier to change player names, those other text strings were not accessible. If you needed to modify that text, or change the pointers to art files, you needed to use a hex editor to open the executable and comb through it until you found the string you were looking for; easy enough when you knew how, but a bit daunting for novices. The editor was also restricted by the height and weight limits imposed by the in-game Create-a-Player function. Players couldn’t be taller than 7’7″ or shorter than 5’3″, and the minimum and maximum weights (133 and 303 pounds respectively) were likewise enforced. If you needed to bypass the limits, it could be done using Lutz’s editor that ran from the command line. Users were also prevented from entering a higher number of three-pointers made and attempted than the total number of field goals. This was handy as it prevented inaccuracies, but as field goals were listed first on the tab, it could be a hassle when entering new stats starting from the top, if they were lower. Despite those limitations and potential annoyances, the NBA Live 96 Editor was still comprehensive, an essential tool for anyone who wanted to edit the PC version of NBA Live 96. Back then, there was no in-game function for editing the original players, and Create-a-Player was far more limited. If you needed to modify a player or overwrite them – the Free Agent Pool only accommodated fourteen players, after all – you needed to do it externally. Editing player data in the executable and roster files was feasible with a hex editor, though nowhere near as simple. Without the tools that Tim, Lutz, and Brien made, we likely wouldn’t have a modding community today. When I open up the editing tools for old NBA Live games, I get the same nostalgic rush that I do when I fire up the games themselves in order to play them. It brings back fond memories of discovering patching, learning how to mod the games, and releasing my earliest work. The NBA Live 96 Editor wasn’t the first tool of its kind, but it’s the one that I spent the most time with in those early years of modding. If you feel inclined to fire up NBA Live 96 and tinker with it, it’s still available to download here. Modding has come a long way since then, but it’s important that we appreciate the steps along the way, and the NBA Live 96 Editor was certainly a significant one.